High Humidity and Indoor Air Quality: Is Mold Proliferating in Your Home? What does humidity control mean for indoor air quality? If you ask most people, even HVAC professionals, you’re likely to hear about humidifiers that can help increase humidity levels in the cold, dry winter months. It’s well known that dry air can cause dry skin discomfort and respiratory irritation. But what you aren’t likely to hear about is active humidity control, which can include humidification and dehumidification. The fact is that high humidity can be even more damaging to indoor air quality than dry air, but it is seldom at the forefront of HVAC design considerations, much less a priority for homeowners. Of course, high humidity is infamous as the enemy in bathrooms, kitchens, and unconditioned spaces where condensation or leaks can cause devastating damage. But as a chronic symptom of a poorly designed whole-house HVAC system, elevated humidity often goes unnoticed. Why is it that high humidity indoor air quality issues have kept such a low profile? 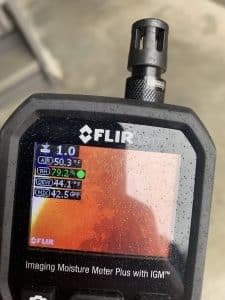 How does high humidity affect indoor air quality, and how can poor indoor air quality due to high humidity be corrected? High humidity causes indoor air quality issues mainly through support of biological infestations. Mold can thrive on any organic material when humidity is sufficiently high, any higher than about 60% at room temperature. These organisms can grow on wood, drywall, organic adhesives and finishes, copy paper, and a variety of other organic materials and components. Mold itself, mold spores, and toxins produced by microorganisms can all become airborne and cause adverse health effects. These airborne irritants and toxins are called bioaerosols. Musty smells and “stale” air are sure signs that humidity is too high and mold is thriving, filling your home with dangerous bioaerosols. Some species of mold are more dangerous than others, but all mold is harmful to homes and the people inside. How Can High Humidity Accumulate? High humidity is frequently a chronic issue in older homes but is also common in new homes. But why? The indoor air quality issues caused by high humidity are often not anticipated during the HVAC design of a home, or are misdiagnosed when they become a problem later. This is because HVAC designers often assume that humidity can be passively managed via a conventional HVAC design, as is the case in arid regions of the country. The thinking goes like this: During the cooler months, cold outdoor air can’t hold much moisture; cold temperatures squeeze water out of the air like a sponge. When heated in the home, the relative humidity of this winter air plummets and creates dry indoor air. During the summer, air conditioning dries warm, moist air through the process of cooling it rapidly then mixing it with warmer air. Through this process, it is often assumed that high humidity can be managed passively with conventional HVAC systems. But this is often not the case in the real world; in high humidity locations, or during higher-humidity-than-normal weather events, these mechanisms may not be enough and humidity can rise unchecked. This can lead to the growth of mold and cause a host of indoor air quality problems and leave home owners with little immediate recourse to correct the problem, even if they know the cause. How dangerous is high humidity? Mold can grow on virtually any organic material in your home. Organic materials are ubiquitous in modern construction- homes are built and furnished with a plethora of materials that are potential mold food. Mold spores are everywhere. Drifting about in the atmosphere on the slightest breeze, they are impossible to avoid. This means that if you have humidity higher than 60%, even if it isn’t all the time, chances are you have active mold populations in your home. The Center for Disease Control, the World Health Organization, and the Institute of Medicine all recognize mold as a serious health risk. Bioaerosols from mold growth can cause mild symptoms in some, but can be deadly for others. In children and those with compromised immune systems, mold exposure can lead to serious respiratory infections and death. Children have been shown to have increased risk of developing asthma as a result of exposure to mold in early childhood. The CDC recommends that any type or amount of mold in the home be treated as dangerous and removed immediately. How can this major health problem be eliminated? First, harmful mold growth must be removed from the home. To do this, professional mold remediation is needed. Professional mold remediation providers can safely remove mold from you home. Once mold remediation is complete, the only way to eliminate the return of mold is to eliminate the root cause- which may be a leak or condensation, but may also be high humidity in the whole house. If this is the case, your home will need to be outfitted with an active humidity management system that can maintain 50% humidity or lower at all times. This is the only sure way to know that mold does not return to wreak havoc on indoor air quality. The first step if you suspect a mold problem in your home is to contact an experienced mold inspection expert. Whatever indoor air quality issues you are experiencing, they will be able to help track down the extent of the damage, the danger to you and your family, and the root cause of the issue. Only with this information can you make a plan to create a healthier environment for the health and wellbeing of the ones you love.